Apartment is lovely, well equipped and has a very comfortable, large bed. We spent most of our time on the terrace with coffee or wine or a snack and that was a treat as the weather was very warm. You can walk to all the major Avignon sites and Les Halles, a few minutes walk away, has a wonderful selection of baked goods, meats, prepared foods, fruits and vegetables in the market hall. Across Place Pie is a regular grocery store that carries pretty much anything you might need. Make sure you have a map if you walking to the apartment as the street is short and a bit difficult to find without the map. Avignon is a city of many fine restaurants and we particularly liked La Forchette which the concierge recommended. 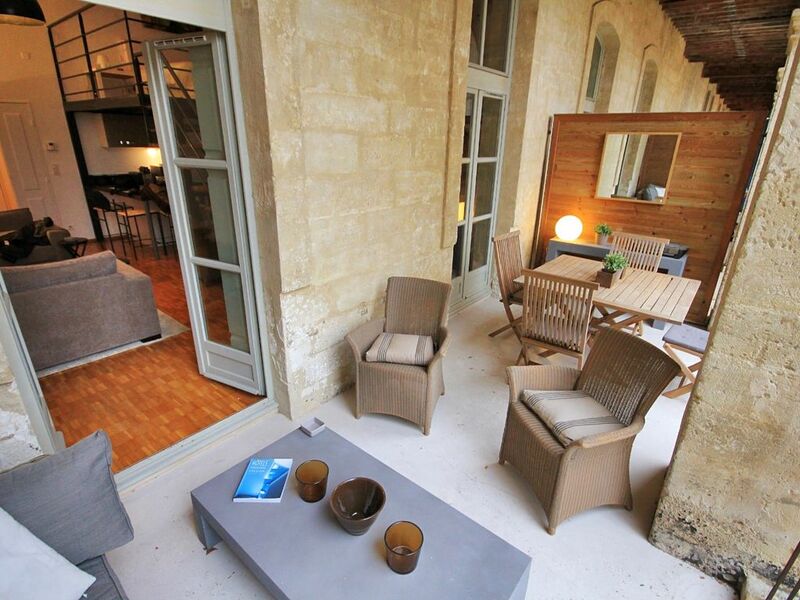 You won’t be disappointed if you stay here and we highly recommend it for a stay in Avignon. Emmanuel was extremely helpful upon check in and also assisted us with a medical issue during our stay. Loved the apartment, very quiet and great balcony to unwind after traveling around Provence. Easy long term car parking nearby. Fabulous time in Avignon. Apartment is superb, well equipped and beautifully furnished. Wonderful balcony which we spent many relaxing hours on. Emmanuel ‘s is a delight. We enjoyed the huge patio. With Les Halles and the supermarche just a lovely walk through the gardens,there was no need to go elsewhere. Television has a wide range of languages. Bathroom is fine. Kitchen has everything including a single serve coffeemaker. Very very quiet. Location is the best. The building gets noticed! Definitely recommend. Perfect spot to experience Avignon. A perfect spot to experience a perfect city, Avignon. My wife and I spent 3 weeks in the Loft, from May to June 2018. The apartment is exactly as depicted in the photos. The owner was responsive, helpful and available whenever we needed to speak with him. He was a delight to deal with. The apartment is perfectly located - less than 5 minutes to walk to the world's most delectable market (Les Halles), the fabulous restaurants and the iconic Rue Republique. There were so many excellent restaurants that we never ate in the same one twice. The veranda was a perfect spot to enjoy fresh squeezed orange juice, baguettes and croissants bought fresh each morning. Equally delightful for a glass of wine at the end of the day. All in all, a perfect place to stay and a great value as well.